BetSafe sportsbook is a great place to enjoy betting online with all the necessary features provided, a wide range of sports events to choose from as well as nice community to join. Launched in 2006, Betsafe is licensed by the Lotteries and Gaming Authority of Malta and has already established a good reputation as reliable and safe online sportsbook. 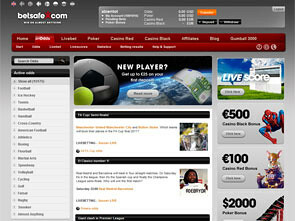 Betsafe also includes poker room and online casino and has over 500,000 customers from about 100 countries worldwide. 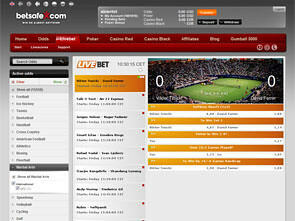 Available in several languages, Betfare site offers you to bet on such sports as boxing, MMA, American football, tennis, cricket, snooker, rugby, basketball, and baseball. Betfare also provides you with odds for every major football league, including the Premier League, Copa Libertadores, UEFA Europa League, Bundesliga, Primera Division, Concacaf Champions League, Champions League, etc. There are not many bonuses available. Just special promotion for new players – 50% up to $25. All you need is to register an account and make your first deposit that can be $50 or less. You should place sports bets equal to the amount of your deposit on trebles with a total odds of 2,00 or higher. A treble consists of 1 bet involving 3 selections in different events. The odds for each of the three objects in the treble must be at least 1,10. Then you should send email at bonus@betsafe.com with your user ID or username in the subject field. The bonus will be transferred into your betting account within an hour or so. Note that players who make their first deposit with Moneybookers/Skrill are not eligible for this promotion. 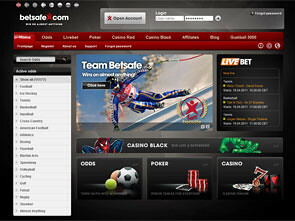 Betsafe sportsbook offers you various features and extras to enjoy. For example, you can take advantage of live betting considering live scores and making your decisions when the game is already played but you still have time to place bets. You also can join My Odds Idea community to share your thoughts, predictions, ideas or maybe complain about live betting or sports events as well. 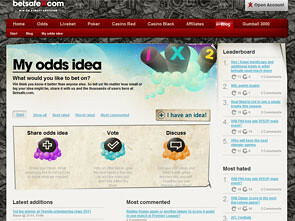 Here you can share your opinion or just communicate with other players to add creativity in your betting online strategy. All you need is to register an account that takes little time and provides you with a lot of opportunities to make your online betting experience comfortable and profitable. With Betsafe sportsbook services you will return here again and again to bet more and more. You can choose among such payment methods as Entropay, Neteller, Visa, Bank Transfer, MasterCard, Moneybookers/Skrill, ClickandBuy. Don’t forget that you won’t get $25 free for the first deposit if use Moneybookers/Skrill. Just avoid it for the first deposit, that’s all. The minimum deposit required is $20. To withdraw your winnings can take up to 7 days depending on the payment option you have chosen. You can contact professional and friendly customer support representatives by email or Live Chat. You also can use the following phone number UK: 0044-808-2800 766. Telephone support is free of charge and is available 09.00-01.00 CET. Feel free to ask questions and find out more about Betsafe services.